SunRock has recently installed two more commercial systems. 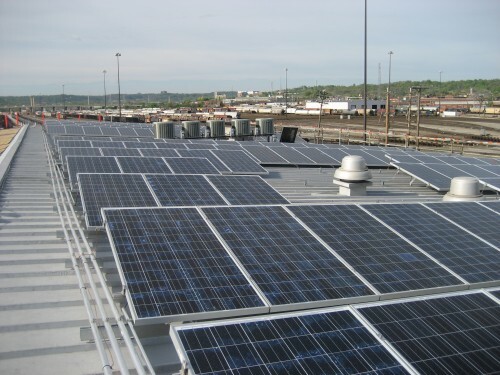 A 51 kW direct tied photovoltaic array was installed on the roof of the locomotive shop at the CSX rail yar in downtown Cincinnati. The system at CSX allows the company to take advantage of financial incentives and offset power purchase from the local utility. For more information about financial incentives available in the state of Ohio, click here. Grabill Heating and Plumbing decided to install a photovoltaic system to offset the electrical costs associated with running its business. It was a two-phase process with the first panels installed in 2011. It is a 19 kW direct tied PV array. The solar panels mounted on the showroom and warehouse and now produce 95% of Grabill’s electrical needs. To see photos of other commercial installations completed by SunRock Solar, click here. Are you wondering if a solar installation is right for your business? Call SunRock Solar at (513) 766-6025 to discuss available financial incentives and how they can make solar affordable for you!